Truly attractive offer - literally everything is thought out to the last detail, since the villa was initially built not for sale, but for family use: 1-st line, decoration, home appliances and furniture of the highest quality are made to order. A professional billiard table for the aristocratic Snooker game brought from Germany - it is very likely that it might be the only one in Montenegro. Location - Montenegro, Uteha village (8 km from Bar). 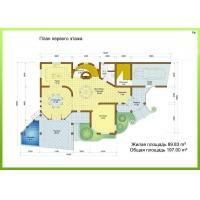 Villa is 497 m2. 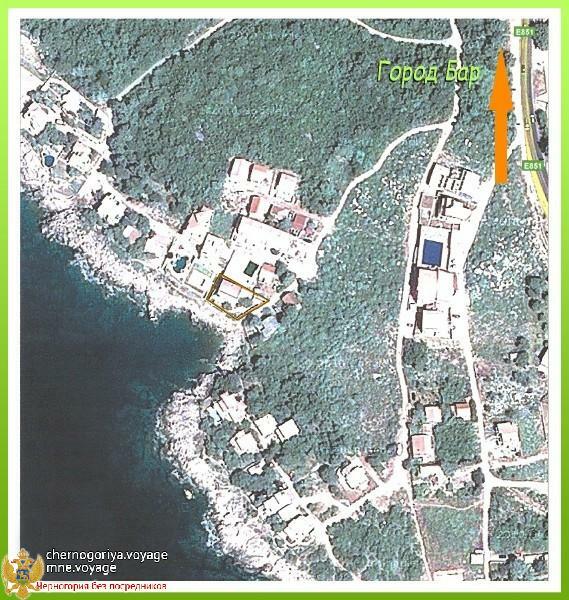 Property is 10 meters from the sea. There is no thoroughfare between the villa and the sea, even pedestrian one. 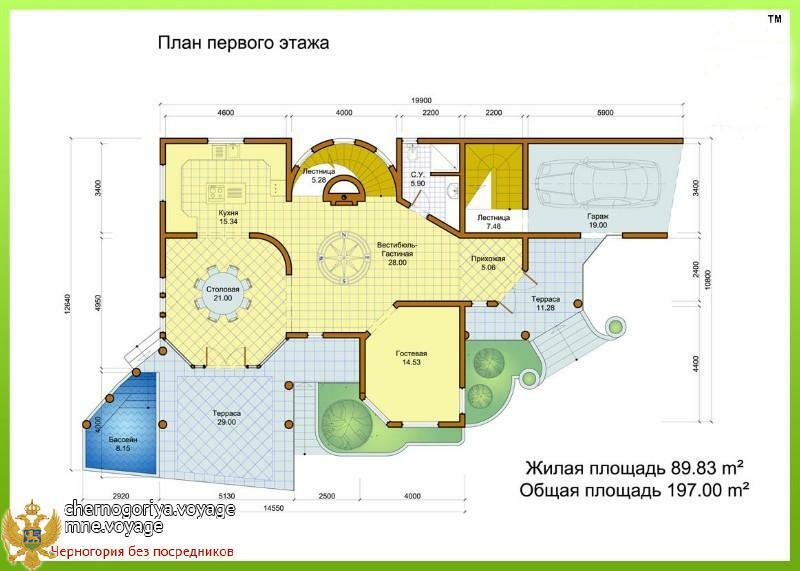 Third floor - a large hall (can be converted into two large bedrooms), terrace with sea views, housekeeping area. 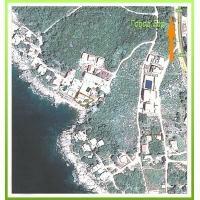 All the issues are to be resolved with the owner, who resides in Montenegro and is ready to show the villa at any time. Do not hesitate and call me to clarify the details! 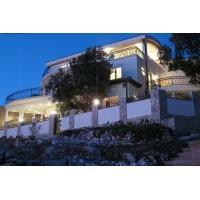 Villa, total area of 497 m2, is located on the coast of the Adriatic Sea in Uteha village, 8 km from Bar. The edge of the first floor terrace is 10 meters from the sea and 25 meters from a small pebble beach, equipped with a comfortable descent. The territory is surrounded by high stone fence with wrought iron framing, which creates a sense of privacy and comfort in a small garden with palm trees, tangerine and lemon trees, as well as kumkuatom. 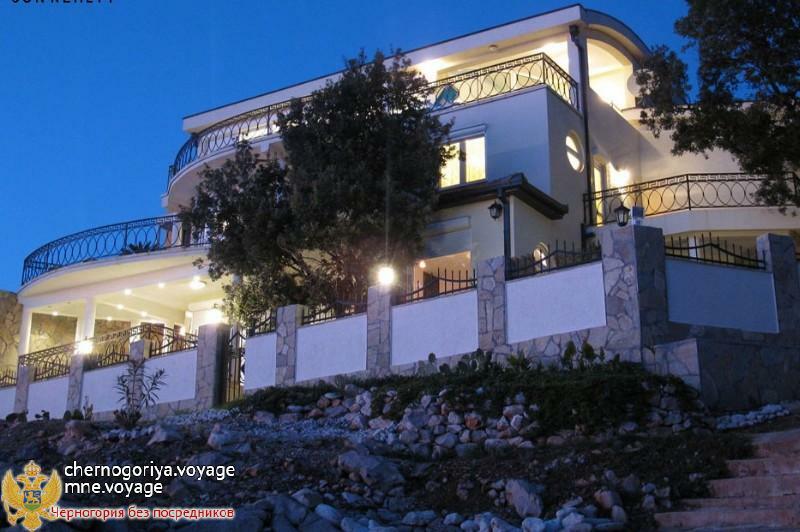 The villa consists of two parts - the main building and a separate apartment with its own entrance for employees (or guests) with one bedroom, kitchen, shower room, balcony and a well-maintained attic. At the entrance to the main building a broad stone staircase leads to the porch, framed by columns. Massive two-leaved entrance door is finished in wood on a metal base. All wood items are made and delivered on request from Spain. 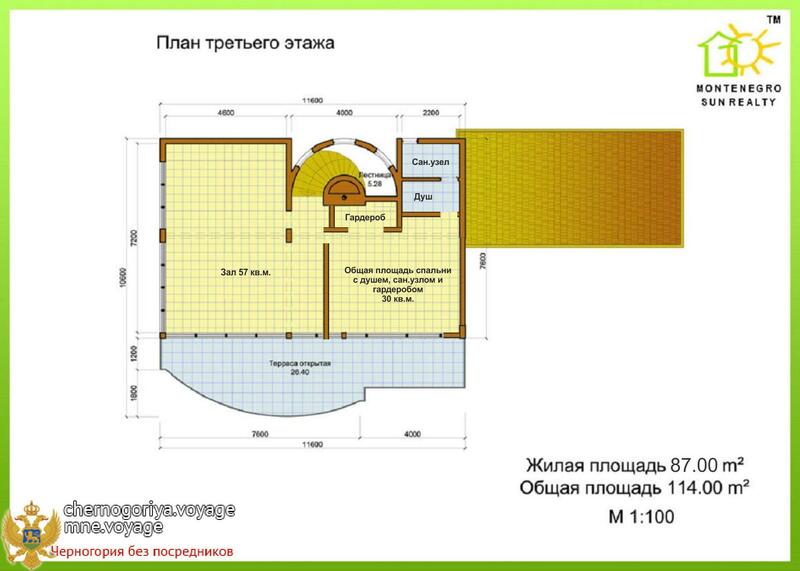 The major part of the first floor is perceived as integrated space and at the same time, it is very functionally arranged. It is a fireplace hall with a large open fireplace, decorated with marble and granite; white-green dining room with an oval glass table, and a large kitchen island, fully equipped with appliances for culinary exercises. A glass wall of white dining room is connected with the terrace of the first floor, where you can spend time with your friends and family at a large round table during warm winters and in summer, listening to the beat of waves on a beach. In a cozy corner, you will find a comfortable sofa. Almost the entire first floor terrace is protected from sun and rain by the visor of the second floorterrace, which rests on white columns. Small freshwater pool is also right there, between the columns. Underwater lighting creates a unique effect in the evening. There is also a TV room with video and audio system, sofa and panoramic floor-to-ceiling windows with views of the sea and the garden on the first floor. Nearby there is a guest bathroom with shower, decorated with unpolished granite, with crystal chandeliers. Semi-circular spiral staircase leads to the second floor. Here you will find a bedroom with glass walls and terrace overlooking the sea and a private bathroom, decorated with travertine (type of marble). The hall doors lead into the second bedroom, office and a bathroom with shower. The rooms are fully furnished with high-quality and convenient Italian furniture. A sofa in the office, if necessary, can be converted into a bed for guests. If there is no need for staff or guards, it is possible to combine the main building with the staff apartment. In that case, the second floor will consist of three bedrooms, an office (one more bedroom), three terraces and three bathrooms. Third floor. Going up the staircase, you will find yourself in a spacious hall with a 12-foot billiard table for the Snooker game. It was brought from Germany by special order and installed by a specialist, taking into account the delicacy of this noble game. On the side, there is a table with a green cloth for card games or solitaire. Spacious room - almost a greenhouse under semi-circular roof with columns decorated with gray marble. Glass doors lead into the openterrace of the third floor, situated under the sun and stars. Here you can easily abandon material thoughts, as the sea, and only the sea fills the space and you almost have that feeling of flying over the water. Right here, under the roof, there is a double bed with a canopy and curtains. This is summer delight - vacation at the seaside with great comfort. 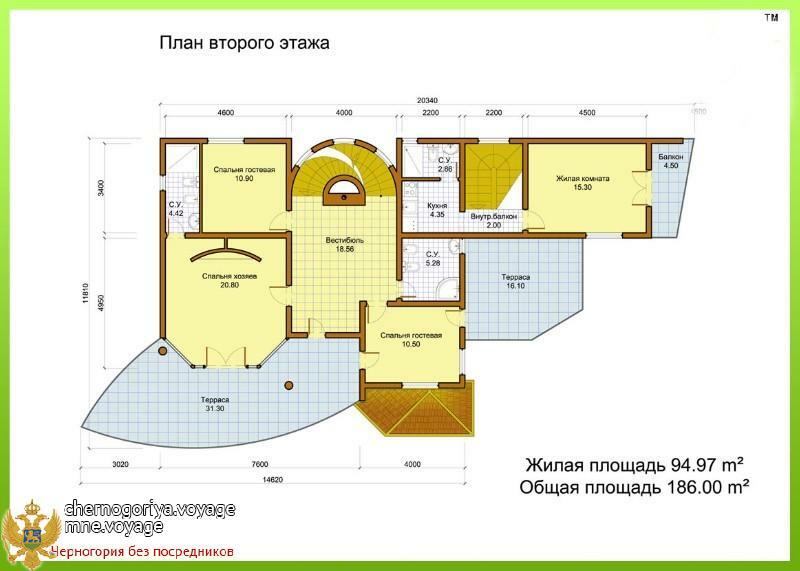 Without any apparent efforts the third floor can be converted into two spacious bedrooms or can be divided into one bedroom and a room for billiard. The house is equipped with air conditioning. During cool season hot water heating, installed in the floor, is switched on. Boiler for hot water heating can run on gas, electricity or pellets. Basement and parkinggarage. 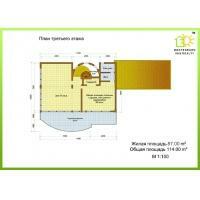 Under the first floor terrace, there is a large basement, an additional area of ​​about 30 m2. Water-treating equipment for the pool, a large washing machine (another one is in the bathroom on the second floor), shelves for jars, hooks for flippers and masks, an inflatable boat, diving and ski equipment (ski resort Kolašin is 2.5 h by car) can be stored here. Your car will be placed in the open parking garage under the house. The fence of the villa is illuminated by decorative lanterns. 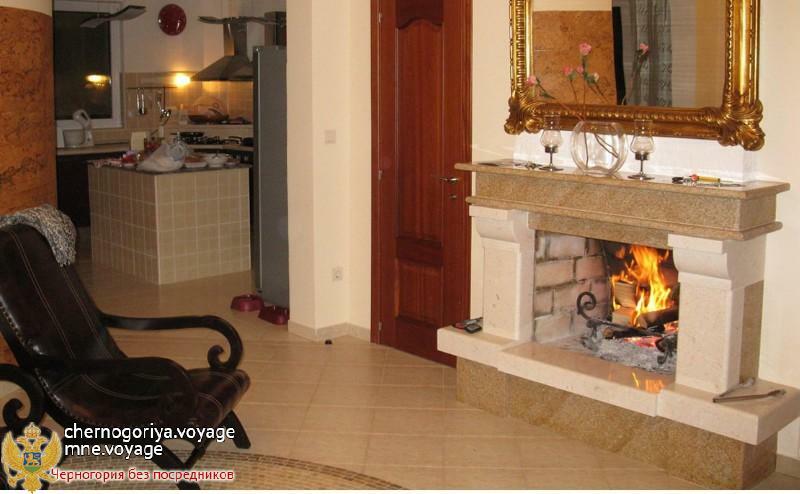 This is the house, where you and your family can spend wonderful time of your life - sea, sun, comfort and coziness. You can move in even today: everything - from bed to forks and glasses is at your disposal. 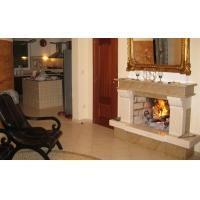 We offer for sale a house, which is fully furnished and has all appliances. The house has all necessary documents. Your future neighbours are trustworthy people.